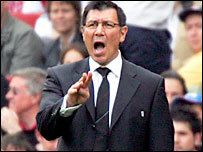 Lawrie Sanchez has resigned as Northern Ireland manager to take over at Fulham. The 47-year-old has been handed an "indefinite, rolling contract" after steering Fulham to Premiership safety following a spell as caretaker boss. He said: "Obviously it is disappointing to not be taking Northern Ireland to the European Championships. "But having discussed this at length with the chairman and the board, I understand the importance of focusing solely on the task ahead." Sanchez took over from Chris Coleman for the last five games of the season, and it was initially thought he may combine managerial roles with Fulham and Northern Ireland. But Fulham chairman Mohamed Al Fayed wanted Sanchez to concentrate on matters at Craven Cottage. He added: "During my last month or so at Fulham I became increasingly enthused by working daily with players on the training pitch, and the satisfaction that I felt at seeing the end result on a weekly basis. "The club has an incredibly professional infrastructure worthy of its Premiership status and it is my aim to finish higher than we have before, and to bring the success that the chairman and the supporters deserve for their continued commitment." Sanchez said:"I believe that the trust placed in me at this time needs to be repaid with 100% commitment. Sanchez added: "Northern Ireland will be a great job for someone and I leave the team in good shape with them at the top of their Euro 2008 qualifying group. "I wish them all the best for the future. They're disappointed but I hope they understand my actions." He said: "I came here with my eyes open. I always wanted to manage here. I have had 30 days of it so far and I've loved it. "It's a good club and I had a great feeling from the moment I walked through the door. "Obviously at the back of my mind I was thinking, I hope I do a great job, but I had no expectations beyond my 32-day contract. "Once relegation had been staved off things moved very rapidly. People were questioning who would be manager, but the club and I came to an agreement which we are both very happy with. "Hopefully I'll be here for the rest of my career." The Irish Football Association released the following statement on their official website www.irishfa.com: "The Irish FA is obviously aware of the situation between Fulham Football Club and Lawrie Sanchez. "And we would be the first to congratulate him on his appointment as their new manager and to recognise the outstanding job he has done for Northern Ireland football and the IFA."